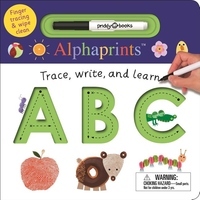 Help your child to trace, write, and learn the alphabet with this unique early learning book. Inside, each left-hand page has grooved letter shapes for children to follow with their fingertips--a tactile, sensory way to learn each letter that creates a memory trace. They can put this memory trace into practice by picking up the wipe-clean pen that comes with the book, and using it to trace over and copy the letter outlines on the right-hand, wipe-clean pages. A highly effective book that can be used time and time again on many levels to make learning letters fun.